I only make one recommendation for new ebook readers: don’t buy Egan’s Goon Squad on an ereader. A later chapter is all graphics (it’s actually my favorite vignette and “saves” my opinion on the book) and it’s a pain to read on my 2nd gen Kindle. Perhaps devices without e-ink displays are different. A note re Dom’s note: Go ahead and read “Goon Squad” on the e-reader if you want. Every reader — of an ereader or a hard copy book — should go online to Egan’s website and read that chapter, a Powerpoint presentation, in actual Powerpoint. The xperience is richer, not the least for inclusing the sounds important to that chapter. 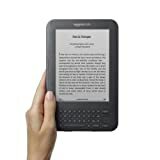 I bought a Kindle last year for an older person with increasing vision problems, and I bought it so she could hear books. But when I press the Aa button and do whatever, the “Text to Speech” thing doesn’t light up, so I couldn’t press it. When you download a book, do you have to do something then so that when the book is on your Kindle, you can hear it? Several years ago I started cataloging the fiction published in The New Yorker in a spreadsheet. The spreadsheet began merely as a way to keep track of what I’d read, but I soon became curious about what the spreadsheet’s data-sorting capabilities could reveal.